The Dorr Letters Project is a digital collection and scholarly project devoted to the correspondence of Thomas Wilson Dorr. The project includes two collections of about thirty letters each. The first collection, presented here, contains digital transcriptions of 25 letters from the Dorr Correspondence files in the Sidney S. Rider Collection at the John Hay Library (Brown University). These letters illustrate aspects of race, reform, antislavery and proslavery politics, and, of course, the Dorr Rebellion. There are more than 2500 hundred letters that are known to exist that either pertain to the Dorr Rebellion and its aftermath or the early life of the rebellion's leader Thomas Wilson Dorr. The editors focused on Dorr's early life (Philips Exeter Academy and Harvard University), his early law career, his political career in the mid-1830s, and his emergence as the leader of the reform movement that sought to revise Rhode Island's archaic governing structure. Each letter is accompanied by an introduction, and a set of questions. This content may be of specific interested to educators who wish to include Dorr-related content in their curriculum. 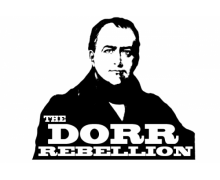 For further resources that may be of use in the classroom setting, please see the Dorr Rebellion Project page (http://library.providence.edu/dps/projects/dorr/index.php) where you will find a short-form documentary on the Rebellion, along with lesson plans, and further resources. The second letters collection, available at the Dorr Letters Project web site (http://library.providence.edu:8080/xtf/), provides educators and students with a unique opportunity to examine the views of those who opposed Providence attorney Thomas Wilson Dorr's attempt to reform the state's archaic governing structure in the spring of 1842. Henry Brown, the author of an insightful history of Pawtuxet Village and one of Rhode Island's leading collectors, has generously made a significant portion of his collection of papers relating to his ancestor John Brown Francis available at the Rhode Island Historical Society Library. The project was funded in part by grants from the Rhode Island Council for the Humanities and the Rhode Island Foundation.